Presta Shop is a very popular e-commerce software which is open source and is free to download from their website. It is the complete package and more in terms of the number of features offered. Presta Shop like any other shopping cart solution offers many basic features though Presta Shop goes one step ahead and has also included many additional features. For yet more customization you will need to hire a Presta Shop developer. Alakmalak is one such Presta Shop development company that has considerable experience in the field. Besides the many other features Presta Shop has a powerful search feature. You might say what can be so special about a search feature. But this is no ordinary search feature; Presta Shop offers a unique set of options to configure its very original search feature. This article explains how you can go about setting those features using the several different preferences and options to suit your unique needs. Prestashop Manage Search ModuleThe search options can be set from the admin panel in the backend of your Presta Shop installation. Goto you admin panel and login first then goto the admin menu Preferences –> Search. The page will load with several sub sections, the first being Indexation. This is where you can set the products to be indexed automatically which is how it is by default though. Presta Shop also gives you the option of setting a Cron Job to rebuild the indexes, besides which this can be done manually as well. 1. Ajax Search: The search occurs without the system reloading the page thus providing a smoother experience to the customers. 2. Instant Search: This is a nice feature where Presta Shop tries to guess which product the customer is searching for while he is typing it and tries to complete the words itself. This does however demand more CPU processing power. 3.Minimum word length: This indicates the size of the words to be indexed in the database. Blacklisted words: The words that you need blocked can be entered her hence the customer will not be able to search with those keywords. The third and final section is the weight preferences. 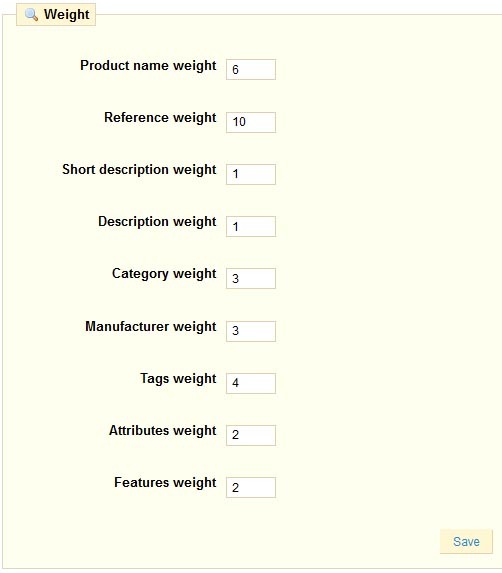 Here it is possible to assign weightage to the options that you think are important and sort them in order of importance.